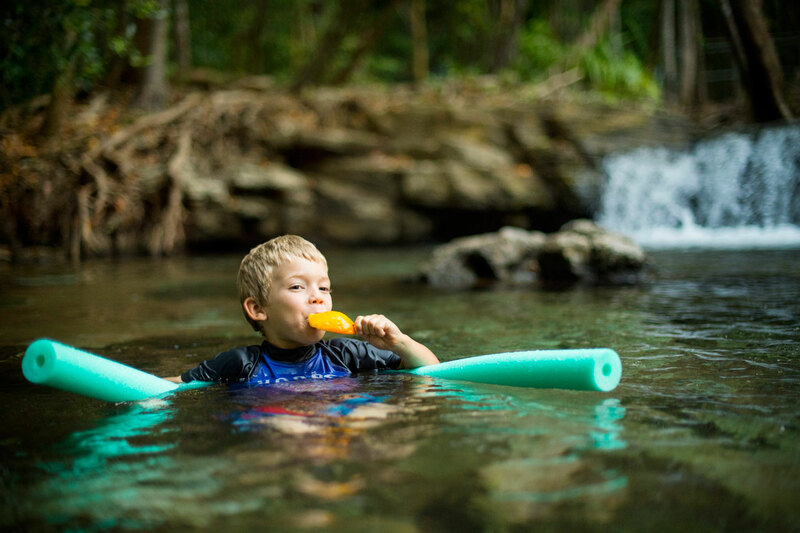 Don’t miss this terrific location close to Darwin where visitors can swim, go bushwalking, or enjoy a picnic. 60kms from Darwin CBD and just a 20 minute drive from Palmerston. Close to many attractions along the Peninsula Way this is a perfect stop for a quick swim or a day relaxing. Crystal clear water is home to many small native fish and other aquatic life that you can see when you swimming. Bring your goggles or grab a pair from the kiosk for a closer look.. The Park is open from 8.00 am to 6.30 pm daily with seasonal closures in places for swimming. The pools are opened after the Wet season rains are finished, and the water level and quality is safe for swimming. At times when there is no swimming, you can still enjoy the shady trees, picnic and barbeque areas and the wildlife. From Darwin, turn right off the Stuart Highway about 47 km south of Darwin. The Park is 10 km along the Cox Peninsula Road. From Palmerston, access is also an easy 20 minute drive via Channel Island, Jenkins and then Finn Road. The kiosk is open when the pools are open for swimming which is 7 days a week during the Darwin Dry season. Here you can purchase daily made sandwiches, salad bowls, local pies, icy cold water and soft drinks, coffee, mango smoothies, chocolate coated bananas and a range of ice creams including the insanely delicious Crazy Acres homemade ice cream made less than 4kms further along the Peninsula Way. Also available are pool noodles to buy or why not just hire for the day? Goggles, swim rings and thongs can be found alongside swim nappies, sunscreen, and insect repellent. Lots of shady picnic areas are available with tables and barbecues making it an ideal place to spend the whole day or relax after a morning walking the Territory Wildlife Park next door. There are several shady pools along Berry Creek which have steps allowing easy access. The top pool has a small waterfall to sit under for a relaxing massage. A lovely loop walking track takes you through two of the Top End’s Natural wildlife habitats. It starts from the picnic area – so take along your binoculars if you are keen on bird watching. During WWII, Berry Springs was part of a Rest and Recreation Camp set up by the armed forces for the 100 000 personnel based in the area. A number of huts and a weir were built at Berry Springs during this time. You can still see their remains around the main pool. 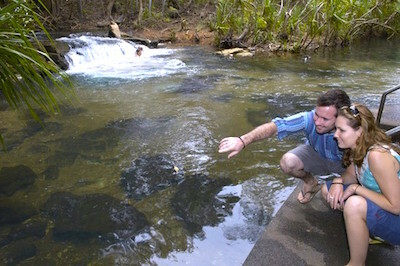 Berry Springs continues to be popular with locals and tourists as a place for rest and recreation.